It's been a while since we've heard, well, anything on Kong: Skull Island. The second entry into a King Kong-Godzilla cinematic universe, the film remains strangely buzz-free. Yeah, even after that rather good Comic Con trailer. Yep - that's a big ape. Director Jordan Vogt-Roberts spilled a few details on the image's context in the movie. “That sequence comes from a point in the movie where you’re not quite sure who Kong is, what his purpose is, how people should be perceiving him," he tells EW. "I’m sort of sick of the notion that a monster movie needs to wait an hour or 40 minutes until the creature shows up," the director explains. 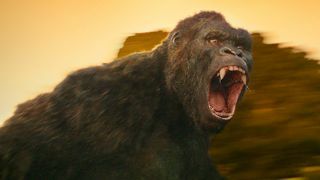 "Kong traditionally does not show up in these movies until very, very late, and the monster traditionally does not show up until very, very late in a monster movie, so a lot of these movies tend to have this structure that’s a bit of a slow burn. Something about this movie made me want to reject that and play a very, very different game." Kong pops up in the opening sequence and kills a bunch of hapless explorers. Boom. Place your bets now, folks.